Predmet rada su stečajni protokoli kao osoben izvor stečajnog prava. Reč je sporazumima između učesnika u stečajnom postupku kojima se rešavaju brojna značajna pitanja u cilju ostvarivanja saradnje i komunikacije među učesnicima. Protokoli su karakteristični za međunarodni stečaj i njima se nastoje prevazići razlike između pravnih sistema koje mogu biti značajna prepreka ostvarivanju najvećeg mogućeg namirenja poverilaca ili efkasnom sprovođenju postupka reorganizacije. Poseban značaj ovog instrumenta uočava se u slučaju grupa društava gde se svaka članica grupe u stečaju tretira kao zaseban entitet, ali gde je u cilju očuvanja ekonomske vrednosti grupe potrebna saradnja između stečajnih upravnika i/ili sudova. Predmet rada posebno dobija na značaju, jer nova Uredba o stečajnim postupcima Evropske unije po prvi put eksplicitno predviđa upotrebu protokola kao mehanizama saradnje (Recital 49). To će svakako imati šire implikacije na stečajno parvo zemalja kontinentalnog prava i doprineti širenju upotrebe protokola. Altman, J., “A Test Case in International Bankruptcy Protocols: The Lehman Brothers Insolvency”, San Diego International Law Journal, Vol. 12, 2/2011, 463-495. Canuel, E. T., “United States-Canadian Insolvencies: Reviewing Conﬂicting Legal Mechanisms, Challenges and Opportunities for Cross-Border Cooperation”, Journal of International Business and Law, Vol. 4, 1/2005, 8-33. Čolović, V. „Institut comity u međunarodnom stečaju - sa posebnim osvrtom na pravo SAD“, Strani pravni život 2/2011, 61-82. 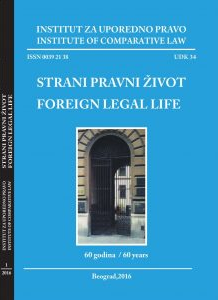 Čolović, V., „Lex fori concursus as the basic rule in the international bankruptcy“, Strani pravni život 4/2016, 85-98. Culmer, D. H, „The Cross-Border Insolvency Concordat and Customary International Law: Is It Ripe Yet“, Connecticut Journal of International Law, Vol. 14, 1999, 563-591. Flaschen, E. D., Silverman, R. J., “Cross-Border Insolvency Cooperation Protocols”, Texas International Law Journal, Vol. 33, 1998, 587- 612. Flaschen, E., Smits, A., Plank, L., “Foreign Representatives in US Chapter 11 Cases: Filling the Void in the Law of Multinational Insolvencies”,Connecticut Journal of International Law, Vol. 17, 2001, 3-39. Halliday, T., Carruthers, B., Bankrupt: Global Lawmaking and Systemic Financial Crisis, Stanford University Press, 2009. Hortig, M., Kooperation von Insolvenzverwaltern, Nomos, Baden-Baden 2008, 216-231, navedeno prema: L. Daum, The Future of Cross-Border Insolvency Protocols From a Civil Law Perspective, master teza, 2009, http://www.bobwessels.nl/site/assets/files/1292/masterthesislucasdaum2_7.pdf, 20.08.2018. Leonard, B., “Managing Default by a Multinational Venture: Cooperation in CrossBorder Insolvencies”, Texas International Law Journal, Vol. 33, 1998, 543-556. Mason, R., “Cross-Border Insolvency Law: Where Private International Law and Insolvency Law Meet”, in: International Insolvency Law Themes and Perspectives (ed. Paul J. Omar), Ashgate, Aldershot-Burlington 2008, 27-60. Mohan, S. C., “Cross‐border Insolvency Problems: Is the UNCITRAL Model Law the Answer?”, International Insolvency Review, Vol. 21, 3/2012, 199-223. Nielson, A., Sigal, M., Wagner, K., „The Cross-Border Insolvency Concordat: Principles to Facilitate the Resolution of International Insolvencies“, American Bankruptcy Law Journal, Vol. 70, 1996, 533-562. Omar, P.J., “European Insolvency Regulation 2000: A Paradigm of International Insolvency Cooperation”, Bond Law Review, Vol. 15, 1/2003, 215-243. Radović, V., Stečajno pravo – knjiga druga, Univerzitet u Beogradu – Pravni fakultet Centar za izdavaštvo i informisanje, Beograd 2017. Reumers, M., „Cooperation between Liquidators and Courts in Insolvency Proceedings of Related Companies under the Proposed Revised EIR“, European Company and Financial Law Review 4/2013, 554-592. Santen, B., “Communication and cooperation in international insolvency: on best practices for insolvency ofce holders and cross-border communication between courts”, ERA Forum, Vol. 16, 2/2015, 229-240. Sexton, A. V., “Current Problems and Trends in the Administration of Transnational Insolvencies Involving Enterprise Groups: The Mixed Record of Protocols, the UNCITRAL Model Insolvency Law, and the EU Insolvency Regulation”, Chicago Journal of International Law, Vol. 12, 2/2011, 811-840. Taylor, S., „The Use of Protocols in Cross Border Insolvency Cases“, in: European Insolvency Regulation (ed. Klaus Pannen), DeGruyter Recht, Berlin 2007, 678-686. Weisz, S. J., Park, K. S., “A Tale of Two Duties: Balancing Comity and Cooperation with Sovereignty in Cross-Border Insolvency Proceedings—A Distinctly Canadian Approach”, The Journal of Private Equity, Vol. 9, 2/2006, 105-114. Wessels, B., “A Global Approach to Cross-Border Insolvency Cases in a Globalizing World”, The Dovenschmidt Quarterly 1/2013, 16-25. Wessels, B., „A Glimpse into the Future: Cross-border Judicial Cooperation in Insolvency Cases in the European Union”, International Insolvency Review, Vol. 24, 2/2015, 96-121. Wessels, B., Markell, B. A., Kilborn, J. J., “Convergence through Legislation and Professional Cooperation”, in: International Cooperation in Bankruptcy and Insolvency Matters, Oxford University Press, 2009, 167-195. Wouters, N., Raykin, A., “Corporate Group Cross-Border Insolvencies between the United States & European Union: Legal & Economic Developments”, Emory Bankruptcy Development Journal, Vol. 29, 2012, 387-423. Zumbro, P. H., “Cross-Border Insolvencies and International Protocols-An Imperfect but Eﬀective Tool”, Business Law International, Vol. 11, 2/2010, 157-169. American Law Institute, International Insolvency Institute, Transnational Insolvency: Global Principles for Cooperation in International Insolvency Cases, 2012, https://www.iiiglobal.org/sites/default/fles/alireportmarch_0.pdf, 21.09.2018. ALI, Principles of Co-operation among the NAFTA Countries, 2000, https://www.iiiglobal.org/sites/default/files/6-_ALI%20Principles%20of%20Co-operation%20in%20NAFTA%20Cross-Border%20Cases_0.pdf, 21.08.2018. ALI, Guidelines Applicable to Court-to-Court Communications in Cross-Border Cases, 2000, https://www.courts.gov.bc.ca/supreme_court/practice_and_procedure/practice_directions_and_notices/General/Guidelines%20CrossBorder%20Cases.pdf, 21.08.2018. Council regulation (EC) No 1346/2000 of 29 May 2000 on insolvency proceedings, Official Journal L 160 , 30/06/2000, pp. 1 – 18. Council Regulation (EC) No 44/2001 of 22 December 2000 on jurisdiction and the recognition and enforcement of judgments in civil and commercial matters, Official Journal L 012, 16/01/2001, p. 0001 – 0023. Cross-border Insolvency Concordat, 1995, https://www.iiiglobal.org/sites/default/files/media/International%20Bar%20Association%20%20CrossBorder%20Insolvency%20Concor.pdf, 21.08.2018. European Communication and Cooperation Guidelines for Cross-border Insolvency,https://www.insol-europe.org/technical-content/eir-2015-part-3, 21.08.2018. EU cross-border Insolvency Court-to-Court Cooperation Principles, http://www.tri-leiden.eu/uploads/fles/eu-cross-border-insolvency-court-to-courtcooperation-principlespdf.pdf, 15.09.2018. EU cross-border Insolvency Court-to-Court Communication Guidelines, http://www.tri-leiden.eu/uploads/fles/eu-cross-border-insolvency-court-to-courtcooperation-principlespdf.pdf, 15.09.2018. Judgment of the Court (First Chamber) of 11 June 2015, Comité d’entreprise de Nortel Networks SA and Others v Cosme Rogeau liquidator of Nortel Networks SA and Cosme Rogeau liquidator of Nortel Networks SA v Alan Robert Bloom and Others, Case C-649/13. Regulation (EU) 2015/848 of the European Parliament and of the Council of 20 May 2015 on insolvency proceedings, OJ L 141, 5.6.2015, p. 19–72. Re Bernard L. Madoﬀ Investment Securities LLC Between United States Bankruptcy Court for the Southern District of New York (Hon. B.R. Liﬂand), Case No. 08-1789 (BRL), (June 9, 2009) and several other jurisdictions. Re Lehman Brothers Holding Inc. Between United States Bankruptcy Court for the Southern District of New York (Hon. James Peck), Case No. 08-13555 (JMP), (June 17, 2009) and court in many other jurisdiction including the Netherlands. Re Loewen Group, Between United States Bankruptcy Court for the District of Delaware (Chief Judge Peter J. Walsh) Case No. 991244 (June 30, 1999) and Ontario Superior Court of Justice, Toronto (Mr. Justice J.M. Farley) Case No. 99CL3384 (June 1, 1999). Re Maxwell Communication plc, Between the United States and the United Kingdom. United States Bankruptcy Court for the Southern District of New York (Hon. Tina L. Brozman), Case No. 91 B 15741, (January 15, 1992) and the High Court of Justice, Chancery Division, Companies Court, Case No. 0014001 of 1991, (December 31, 1991). Re Nakash, United States Bankruptcy Court for the Southern District of New York, Case No. 94 B 44840, (May 23, 1996) and District Court of Jerusalem, Case No. 1595/87, (May 23, 1996). Re Sendo International Limited, Between the commercial Court of Nanterre, France (Mr. Justice Jerome Mandrillon) and the Chancery Division of the High Court of Justice, London (June 1, 2006.). Daum, L., The Future of Cross-Border Insolvency Protocols From a Civil Law Perspective, master teza, 2009, http://www.bobwessels.nl/site/assets/fles/1292/masterthesislucasdaum2_7.pdf, 20.08.2018. Landolt, S., The Cross-Border Insolvency Concordat And Its Application In The Us-Switzerland Case Re AIOC Resources, 2004, https://www.iiiglobal.org/sites/default/fles/2-_Landolt_0.pdf, 24.08.2018. Lord, D., Cross-border insolvency protocols – do they work?, http://clients.squareeye.net/uploads/3sb/events/300904_lord.pdf, 26.08.2018. Maltese, M., Court-to-court protocols in cross-border bankruptcy proceedings: diﬀering approaches between civil law and common law legal systems, https://www.iiiglobal.org/sites/default/files/media/maltese_michele%20submission.pdf, 27.08.2018. Paulus, C., Judicial Cooperation in Cross-Border Insolvencies: An outline of some relevant issues and literature, 2011, http://siteresources.worldbank.org/GILD/Resources/GJF2006JudicialCooperationinInsolvency_PaulusEN.pdf, 21.08.2018. Satiro, F., Campana Filho, P. F., Transnational Insolvency: Beyond State Regulation and Towards Cooperation Agreements, 2011, https://ssrn.com/ abstract=1858968, 20.08.2018. Spigelman, J., Cross-Border Insolvency: Cooperation or Conﬂict?, 2008, http://ssrn.com/abstract=1800444, 20.08.2018. UNCITRAL, Practice Guide on Cross-Border Insolvency Cooperation, United Nations, New York 2010, 28, http://www.uncitral.org/pdf/english/texts/insolven/Practice_Guide_Ebook_eng.pdf, 28.08.2018. Van de Ven, F., The Cross-Border Insolvency Protocol; what is it and what is in it? From a European Union Perspective, master teza, 2015, https://www.academia.edu/15056737/The_Cross-Border_Insolvency_Protocol_what_is_it_and_what_is_in_it_From_a_European_Union_Perspective, 20.08.2018. Wessels, B. Cross-border insolvency agreements: what are they and are they here to stay?, 2011, http://www.bobwessels.nl/site/assets/fles/1405/crossborder-agreements-nijmegen-fnal.pdf, 03.09.2018.